The bubbly and talented actress Srishty Rode got evicted from the Bigg Boss 12 this weekend. In an exclusive interview with Mumbai Live, the actress spoke about her journey and shared her experience of staying in the BB house. 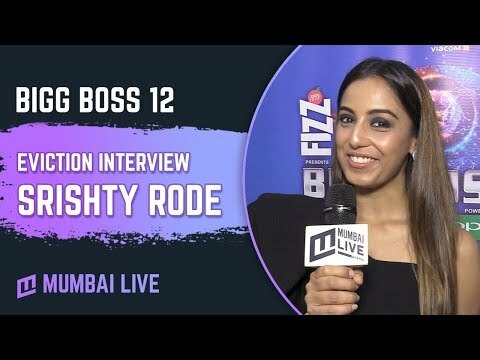 One of the most playful contestants of season 12, Srishty Rode is evicted from the Bigg Boss house. The bubbly and talented actress' journey has been an entertaining one. After Rohit Suchanti’s entry, Srishty found another best friend in the house. But her friend was insinuated as a romantic relationship but she took a strong stand against such allegations. "We share a friendly relation there was nothing more in it. Housemates tried to create a love angle between me and Rohit, however, they were failed. As far as my followers are concerned that know that they understood that this relationship is not going in any other direction", mentioned the actress. Srishty’s dressing style has been the most talked about in the house. Each day she would be seen donning different costumes and hairstyles, and would also help the other contestants with their beauty regime. Along with this, Srishty has proven to be a tough contender week after week. She voiced her opinions whenever needed. She started off being friends with the celebrity contestants but soon drifted to the Khan sisters. But in one of the captaincy, she was against Saba Khan and a heated argument between them led to a major consequence. She was never allowed to be the captain of the house post that. But this decision did not demean her and she strongly played the game.